This scenic route from Romanshorn on Bodensee to Luzern is operated jointly by the Sudostbahn (SOB) and Swiss Federal Railways (SBB). The Voralpen Express runs every hour and takes just under three hours to complete the 146 km journey. Each train is formed of traditional loco-hauled rolling stock with some carriages still having windows you can open! 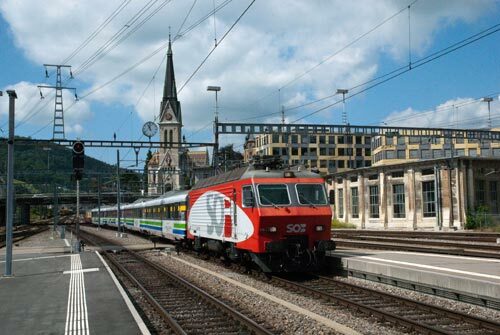 Photo - Sudostbahn Re 4/4 no.16 with a Voralpen Express from Luzern to Romanshorn entering St.Gallen station. The SOB starts on the shores of Bodensee at Romanshorn from where ferries operate across the lake to Friedrichshafen in Germany. The first 25 minutes of the journey to St.Gallen are through pleasant country although scenically not that spectacular. From St.Gallen, where I joined for this trip, the route becomes much more interesting with exceptional pre-Alpine scenery throughout. If you are interested in the view then from St Gallen through to Arth-Goldau it is probably better on the right hand side facing the direction of travel but as you near Luzern it is probably a good idea to swap sides of the train. Waiting in glorious sunshine under the train shed at St Gallen the 12.02 departure for Luzern arrived on schedule. Formed of five coaches the first vehicle was older stock and had opening windows with the remaining coaches in Voralpen Express livery and fully air-conditioned. At the head of the train was an SBB Re 4/4 no.11192 a member of this versatile class of locos introduced to service in 1964 that are still to be found across most of Switzerland. I have completed this journey a number of times and it never ceases to amaze me that man-made structures make up about an eighth of the total track length with 136 bridges totalling 4.2 km in length with 20 tunnels of 8.5 km length through mountains. After leaving St Gallen the train goes up and over the SBB main line to Zurich and almost immediately crosses a superb high level viaduct. The views suddenly improve as you make for Herisau, Watwil and Uznach. A little while later the railway follows the shore of Zurichsee which is on the left hand side to reach Rapperswil. After leaving the latter station the railway crosses the lake on a causeway shared with a road to arrive at Pfäffikon. Leaving Pfäffikon the railway bears left and climbs steeply uphill using adhesion only to Wollerau and onto Bibberbrugg from where a connecting bus service can take you to Einseideln. Up again with cow bells tinkling in the meadows through open carriage windows. A shrill whistle from the loco brings back memories of steam and we begin a steep descent. On the left, far below, you can see the main line heading south to Italy via the St Gotthard Tunnel as with brakes screeching you descend to Arth Goldau. Leaving AG you will Zugersee on the right hand side before reaching Küssnacht on the shores of Lake Luzern. From here it's only a short trip to the end of the journey with the outskirts of Luzern soon appearing. The train passes the Luzern Transport Museum with a glimpse of some of the locos on display. Slowing for the final approach to Luzern you cross the River Reuss from where you get an excellent view of the wooden Kapellbrücke on the left. Soon you have arrived at the not so inspiring main station at Luzern. A few minutes' walk brings you to the shore of Lake Luzern with lake steamers berthed ready to take for a cruise. So you have ended a memorable journey on the Voralpen Express from the shores of Bodensee to Lake Luzern crossing some wonderful scenery en-route.